Today I stumbled across a nice little video about telling written Frisian, Dutch, and Afrikaans apart. This is a very worthwhile subject if you are traveling in the Netherlands as a foreigner. Here, I'd like to expand a bit more on a few tricks that I have picked up for distinguishing spoken Frisian from Dutch as a foreigner, other than "Hey... I actually understand some of what they're saying... that must be Frisian!" As the video notes, the "jij" in Dutch can be very helpful. It sounds like the word "eye" with a y- in front [YIGH] and is one way of saying "you"... the plural "you"--"jullie" [YOO-lee] also is distinctively Dutch. 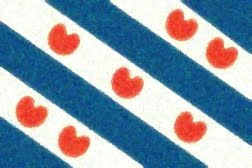 If you hear "kijk" [KIGHk] (with the same vowel in English "kite"), this is another sign that you are probably hearing Dutch and not Frisian. It means "look," so it is a reasonably frequent word in Dutch, but is not something you'd encounter often in Frisian. Conversely, if you hear a lot of sounds close to the English "chin," that is more likely Frisian. E.g., sjen, "look," and tsjin, "against." The words "het" and "met" are give-a-ways that you are hearing Dutch. That harsh, throat-clearing consonant in "het" is far more common in Dutch than Frisian, though the consonant does show up in Frisian sometimes. Some speakers seem to use it more than others. Dutch, unlike Frisian, also uses that harsh consonant frequently to begin past participles, spelled with a beginning "ge-" but sounding like a German ch followed by the "eh" vowel in "head." Why is this helpful? Well, for one, Frisian-language broadcasting isn't always in Frisian. It's assumed that viewers speak Dutch too, so people responding to news interviews may well be replying in Dutch and not Frisian. Good to know when you are a foreigner.